Your Permanent Resident Card becomes technically invalid for reentry into the United States if you are absent from the United States for 1 year or more. Your U.S. permanent residence may be considered as abandoned for absences shorter than 1 year if you take up residence in another country. A reentry permit establishes that you did not intend to abandon status, and it allows you to apply for admission to the United States after traveling abroad for up to 2 years without having to obtain returning resident visa. Reentry permits are normally valid for 2 years from the date of issuance. (1) How do I get a reentry permit? To obtain a reentry permit, file Form I-131, Application for Travel Document. You should file this application well in advance of your planned trip. (2) What will happen if I do not apply for a reentry permit before I travel outside of the United States? If you are an LPR planning to travel outside of the United States for 1 year or more, it is important that you apply for a reentry permit before you depart the United States. If you stay outside of the United States for 1 year or more and did not apply for a reentry permit before you left, you may be considered to have abandoned your permanent resident status. If this happens, you may be referred to appear before an immigration judge to decide whether or not you have abandoned your status. If you are in this situation, contact the U.S. consulate about a returning resident visa. (3) I am a LPR and need to travel abroad. 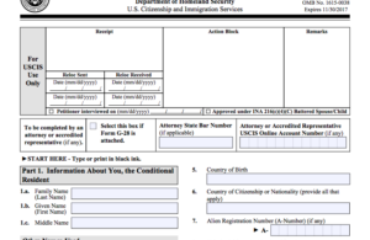 Can I file my Form I-131 to get a reentry permit while I am outside the United States? No. You cannot file a Form I-131 to obtain a reentry permit unless you are physically present in the United States when you file the form.You should file your Form I-131 no fewer than 60 days before you intend to travel abroad. (4) If I file Form I-131 to get a reentry permit while I am in the United States, will USCIS deny the Form I-131 if I leave the United States while the form is still pending? a reentry permit to you if your biometrics (photo, fingerprints) have been obtained. You can indicate on your Form I-131 that you want USCIS to send your reentry permit to a U.S. Embassy, consulate or a DHS office overseas, so you can pick it up from one of those facilities. (5) If I file Form I-131 for a reentry permit while I am in the United States, can I submit my biometrics while I am outside the United States? No. When you file your Form I-131 to obtain a reentry permit, USCIS will notify you when to appear at a designated Application Support Center (ASC) to obtain your biometrics. You must provide your biometrics at the ASC while you are in the United States. If you leave the United States before you provide your biometrics, USCIS may deny your application. (6) What if I must leave the United States before I can file a Form I-131 for a reentry permit? You do not need a reentry permit if you will be outside the United States for less than 1 year. If you have been outside the United States for less than 1 year, you may use your Permanent Resident Card (Form I-551) as your travel document. (7) I have an old reentry permit. Do I need to turn in my old permit if I am filing for a new one? Reentry permits cannot be extended. If your permit expires, you’ll need to apply for a new one. If you have a valid reentry permit in your possession, you will need to send it in when you apply for a new one. You need not send in an expired reentry permit. For security reasons, USCIS will not issue a new reentry permit to someone who already has a valid one in his or her possession. If you need a new reentry permit because your previous one was lost, stolen, or destroyed, please indicate this on your application for the new permit.